Does the package contain a foundation plan and a roof plan? If possible could you please let me know every type of drawing and plan included in the package? Their site explains what’s included with the plans. Foundation plans are not included because this can change from location to location. Foundation plans are site specific. Build in non-code areas and you don’t need a foundation plan. Just use gravel bags on a rubble trench. Roof plans are only included with more complex plans. A roundhouse is simple. Just buy trusses from a truss company. Contact Structure1.com for a free estimate. They can get it approved, but obviously the cost will be higher. 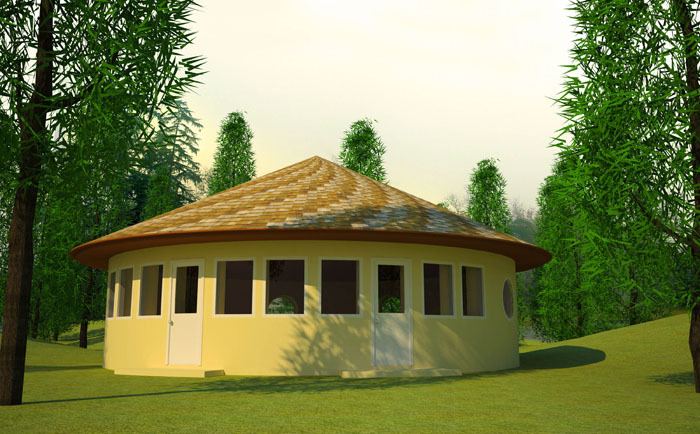 Oh, we will not be doing a dome… just a circle with straight 8′ side walls and a regular living roof. I guess the 33′ applys to the dome…? Thank you for your reply. Right, the 33′ applies to domes. Roundhouses are easier. But still any large structure is more difficult and needs more careful design. A few tips: don’t make windows too large; add 1/2″ rebar pins downs through the center of bags ever 2′ and next to doors and windows; add benches or buttresses next to exterior doors (the weakest area). Thanks for all your info. I notice the maximum on a circle design is 33′ without buttressing. Why? I am planning a 50′ in diameter and berming the northern wall. Using a rubble trench and sand bags 18″ wide filled with limestone. How many buttresses will I need in your opinion? and at what locations? I can send a rough sketch of what I have, but was just curious why if a circle (in so many builders option) is so much stronger than a square, why it can only go up to 33′ ? 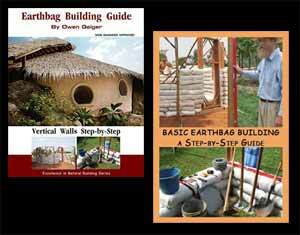 Have you built a smaller earthbag dome so you understand the basics? Research the Om Dome in Thailand and you’ll see how difficult it is. what is the cost for this 10 meter house? SHOWED ABOVE…. what is the average cost per SQ METER FOR EARTH BAG HOMES? Our blog has hundreds of ideas for reducing the cost of houses — almost 2,000 free blog posts. You can build extremely low cost houses with recycled bags, local soil, etc. Just keep reading and learning and eventually you’ll get what you need. 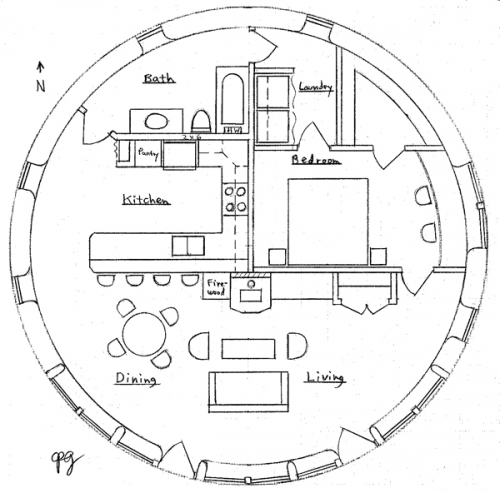 I found a really nice picture of a finished round house of your design. Thought you might enjoy the finished look. Can we buy a plan for this plan to be the first main floor and your two bedroom design plan, of this same round house size , to be the basement floor. How much to combine the two plans to make a two story house with stair case? Sure, you can combine those plans. But you’ll need to find a local designer to make the changes. It’s too time consuming to do by email. Plus, the codes vary so much that it’s best to hire someone local.